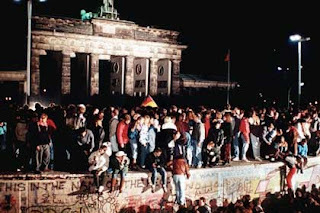 With the 20th anniversary of the fall of the Berlin wall, I’ve been thinking a lot about the event. Looking back on it, it’s hard to describe just how shocking it was for this to happen, and so suddenly. I might have been more aware of the wall and the cold war generally, since I read a lot of spy novels and Tom Clancy books at the time, but I think it’s safe to say that at the time no one thought the wall would ever come down, or at least not in our lifetimes. I had been dimly aware at the time of how relaxed travel restrictions from Hungary and Czechoslovakia had led to large numbers of East Germans leaving the country and trying to get to the west through those countries, but I didn’t think too much of it. Anytime there had been protest like this, inevitably the government would crack down, become more restrictive, and do everything they could to prevent things from getting out of hand. I just heard on a documentary about the fall that Erich Honecker had plans to further improve the wall. But then came November 9th. News showed people standing on the wall. This was just inconceivable. How could they be there without being shot? As we watched we discovered that the East German government had tried to diffuse the situation by relaxing travel restrictions themselves, but the people realized even before the government did that this meant the wall had no purpose. Anything could have gone wrong at any point along the way. The soliders could have fired to prevent the people from leaving: they had no orders telling them to let the people through. But the beauty of what happened that night is that the Berlin wall fell because the people wanted it to. After almost 30 years, it was finally too much, and it could not stand. The other thing that I knew that night was that the cold war was over. It would be another year before reunification. Two before the USSR ceased to be. But it was those people standing on the wall that was the real end. And it still gives me chills.